Any 2nd Generation Ford Econoline van collectors? Haha... me too!! But still waiting for the milliput to harden out... Bought some 2 component filler for car-use & will continue once the temperature drops to reasonable levels! (like after summer/autumn!). Found myself some Milliput; great stuff. 2 way Epoxy. You can use it with some water to make it more flexible. filling... sanding.... And some grounding-spray from Revell, to see where some more work needs to be done... Not bad for first layer! Roof lines matching up 100%! Shortening the chassis... adjusting here/there... Some nails as reinforcement.... Fits underneath! 'Some' smoothing/filling/painting to be done! Thanks to Greg (GLMFAA1) willing to part with one of his Econolines, I got a complete set to rebuild my Shorty '69. Starting with this: via intermediate cutting with a hot stanley knife (using a 'creme brulee burner'! 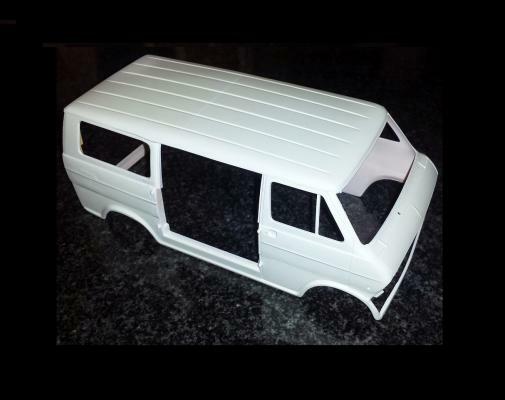 (Roof needed to be cut exactly half-way as the van is tapered front to back...) to get it shortened to the 105" Shorty wheelbase (1:1).... More to follow! Careful that you don't get over-enthousiastic & buy 2...!